The Veranda offers accommodations in a unique historic setting. 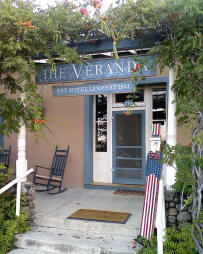 Built in 1883, the Veranda is the oldest hotel in West Texas. This distinctive adobe building, with 2′ thick walls and 12′ high ceilings, has ten rooms and suites furnished in period antiques. All rooms and suites have private baths. An excellent breakfast is served every morning featuring “from scratch” recipes that our guests come back for. Experience the Veranda!